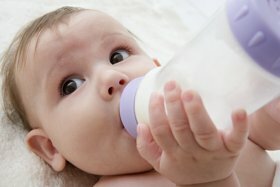 The Canadian Paediatric Society (CPS), Dietitians of Canada and Health Canada recommend that babies who are not breastfed should receive a commercial infant formula for the first nine to 12 months of life. The formula should be cow’s milk-based; use soy-based formula only if your baby can’t take dairy for health, cultural or religious reasons. Iron-fortified formula is recommended, and special formulas are available for premature or allergic infants. You should consult your Pharmacist about the formula that is best for your baby.